The Rebel Sweetheart. : Foodie Goodie | Jack Skellington Cupcakes. With the Day of the Dead just around the corner, I'm sure there are lots of Halloween parties happening left and right. If you're hosting one, here's an idea. Spice up (or should I say 'spook up'?) your dessert table with this quirky treat inspired by the king of Halloween himself - Jack Skellington! They make great giveaways for the kids (and kids at heart), too! 1. Preheat oven to 325 °F. Line cupcake pans with paper liners; set aside. 2. In a bowl. combine flour, sugar, baking soda, cocoa powder and salt. Mix on low speed until blended for about 3 minutes. 3. Add in butter, vinegar and eggs 1 at a time until combined. Slowly add milk to batter until completely mixed, scraping down the bowl as you mix. 4. Scoop batter into baking cups filling about 2/3 full. Bake until a toothpick inserted in the center comes out clean, about 17 to 20 minutes. 5. Frost the cupcakes using the white buttercream. 6. 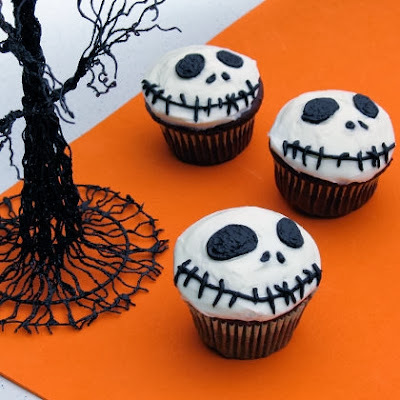 For each cupcake, use the tip of a toothpick to lightly etch the outline of two large Jack Skellington eyes in the frosting. 7. Slowly pipe black decorator's icing onto the etched lines and then fill in the inner circles. Use another toothpick to spread and smooth the icing. 8. Pipe on two short lines for a nose. Next, pipe a long line across the bottom of the cupcake for the mouth. 9. For the finishing spooky touch, randomly top the mouth with a bunch of short icing barbs. Don't know about handing them out to the little hob goblins at my door-but if I had a party-they would sure be a hit! Great fun to decorate at Halloween. My son and grand kids would love these. Thanks for sharing - I might just makes these. How cute yet simple. I think that my older daycare kiddos could even do this and I think that they would have a great time doing it. Thanks for sharing this great idea!! Very timely for trick or treats! nice! sigh baking I wish I could I have such a sweet tooth! My husband would love these! He just watched that movie a few days ago...it's one of his favorites. Cute cupcakes, perfect table centerpieces too! Can;t believe there's so much hype in Halloween celebrations nowadays. In my time, we never even recognize halloween. would love to make this with the kids!